- Make risotto by heating oil in a large casserole dish over medium heat. - When oil is warm, add chopped onion and garlic. Sweat 5 minutes. - Add rice and saute 3 minutes. Stir continuously with a wooden spoon. - Add 1/2 cup wine and reduce until almost dry. - Add chicken stock as needed, 1/2 cup at a time until rice is tender and creamy. Add salt and pepper to taste. - In a separate pan, heat olive oil and lightly brown duck. - Add mushrooms and sweat with duckling for 10 minutes. Drain excess olive oil. - Deglaze with remaining white wine. - When duck is almost cooked, sprinkle with sage leaves. Remove pan from heat and let rest, covered. 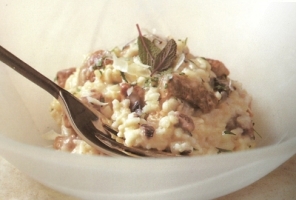 - When risotto is ready, add duck mixture to it and finish with butter and cheese. Season with salt and pepper. Sprinkly parsley leaves over risotto and serve.